This article about the electrical insulator has been written by one of the members of the EEC (Electrical Engineering Community), whose nickname is K.
If you want to send debates, articles, reviews or stories about your career or studies, do not hesitate to contact us via email. Electrical insulator insulates and separates the charged portion of any equipment or machine from the uncharged part. In overhead electrical distribution lines, insulators cover the main conductor and keep it at a safe distance so as to protect its surroundings. Insulators also help maintain appropriate clearance of live line from the support structures. Insulators are an important and vital part for any transmission or distribution line and are more costly than the other parts of a pole or tower. Insulators designed for the distribution and transmission of electrical power via overhead lines are also capable of enduring large tensional and compressive loads. a. High mechanical strength and rigid. b.	Insulators should be non-porous and shock resistant (as far as possible). c.	Insulators should possess tolerance for high temperatures. d.	High endurance for electrical stresses. An insulator poorly designed, maintained and/or chosen for a particular role can fail and cause considerable revenue loss. Following reasons account for most of electrical insulators’ failure. When an insulator fails to endure routine or incidental electrical stresses, the electric arc passes through its body causing damage throughout the insulating medium. This phenomenon is known as puncture and causes the replacement of affected insulator. Excessive voltages surpassing the rated maximum voltage capacity of a particular insulator causes it to flashover. When a surge or lightning strike causes a voltage spike, insulators are more likely to be flashed over. Flashing decreases the reliability of an insulator and may cause it to puncture according to the severity and location of flashover. Safety factor is measure of resistance an insulator offers to a puncture. Greater the safety factor, lower is the probability that an insulator will be punctured in an event of flashover. Safety factor can be calculated by dividing puncture voltage by the flashover voltage of an insulator. 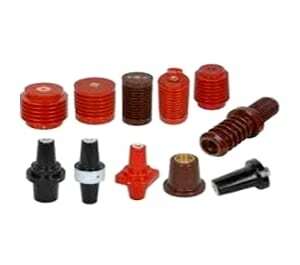 Insulators come in various configurations and are tailored according to the mechanical roles expected out of them. Choice of insulators for every pole or tower in a distribution line is governed by the design parameters. We will not be covering the design techniques in this article, however let us discuss the physical types of overhead insulators briefly. 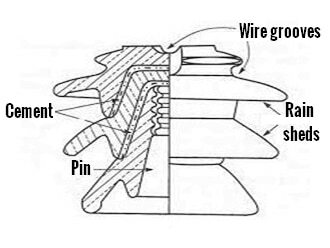 Pin type insulators involve a pin to hold the mechanical load of conductor. 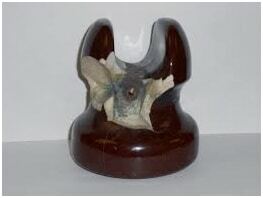 Single sets of this type of insulators are widely used in LV distribution networks. Pin type insulators are easy and economical for mass production as well as on-site handling and maintenance. Suspension type insulators are simple insulator units connected as a string. A single disk type insulator attached in a suspension type insulator strings covers almost 11 KV. Suspension type insulators are easier to replace (or corrective maintenance) but difficult to maintain as extensive cleaning and washing is required. Tension type insulators are same as the suspension type insulators but are better designed for tensional pull of the conductor and allied hardware. Angle or joint type towers/poles require the use of tension type insulator string(s). Both porcelain and glass insulators provide excellent insulation and high puncture strength. But porcelain insulators are more hydrophobic than the glass and it naturally discourages moisture condensation on the insulator surface. Glass provides more puncture strength and thermal tolerance than those of porcelain insulators. Fiber glass and epoxy polymer layers are merged together to manufacture composite polymer type insulators. Composite material insulators are new and trendy insulators with a lot of advanced benefits and flexibilities. They are lighter (almost 65 percent than the conventional insulators), equally strong, puncture resistant and are less prone to flashovers and corona discharge. Composite materials are more resistant to air pollution and have increased hydrophobic properties. 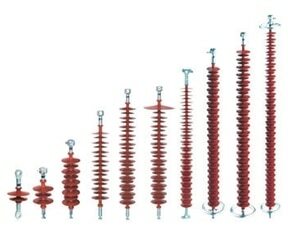 Different power distribution and transmission companies have reported the failure of composite material insulators on angle and joint locations suggesting a low capacity for tensional forces. Another major disadvantage is faster aging of polymer type insulators. Choice of suitable insulators for any power carrier line is a tricky process and should be given proper attention. Consultants should evaluate and design/recommend the insulators according to the factors discussed above. Climate, distance from the coastal belt, nature of air pollutants and artificial humidity affect different insulators differently and should be discussed in the planning phase. Double suspension and tension strings are also advised at railway/road/buildings’ crossings and transmission lines’ intersections. How to choose the appropriate electrical insulator? If you think there are things to add to this article, please post a comment in the area below. or copy this trackback: http://engineering.electrical-equipment.org/safety/electrical-insulator-mv-lv-distribution-overhead-lines.html/trackback from your own site.